Don’t Outsource Thurston County! Whose Job is Next? 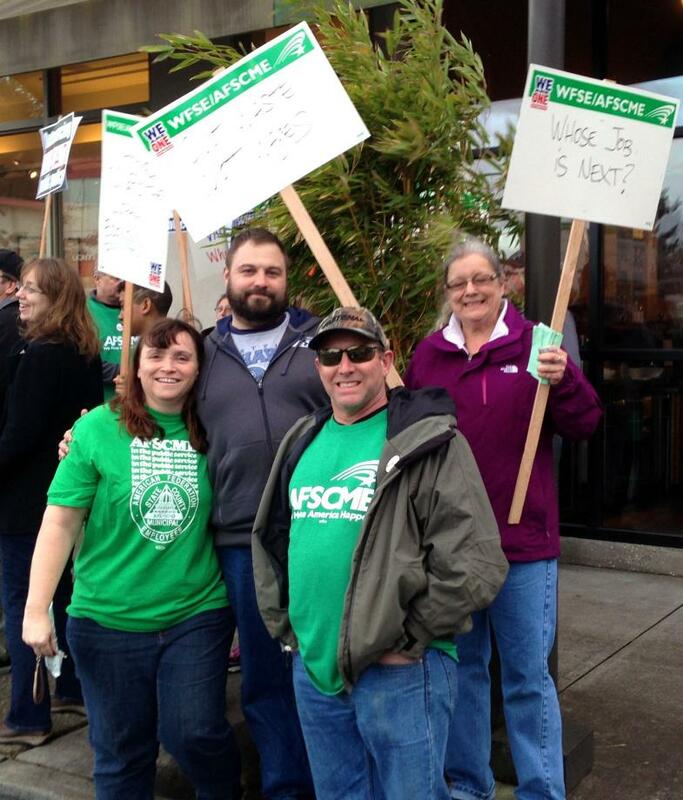 On Monday, March 3rd, 2014 over 100 Union brothers and sisters gathered to protest Thurston County Commissioner Karen Valenzuela’s campaign kickoff event. Custodial staff, who are the County’s lowest paid workers, is wrong. In essence she is trying to balance the Counties budget on the backs of the most vulnerable County employees. All work deserves dignity. While the County has bargained the impacts of the decision to outsource they continue to refuse to look at other options at balancing their budget that do not include the elimination of nine family wage jobs. The custodians are career employees at the County, with an average of 13 years of seniority. Council 2 maintains that Thurston County can cancel their contract with the Private for Profit Company at any time and that we can still go back to the bargaining table to collaborate on finding other concessions that do not include outsourcing. Our effort has been supported by several organizations outside the labor community including the Thurston County Democrats and the Conservation Voters.